You are here: Home 2009 April Are running shoes a waste of money? At Stanford University, California, two sales representatives from Nike were watching the athletics team practise. Part of their job was to gather feedback from the company’s sponsored runners about which shoes they preferred. Unfortunately, it was proving difficult that day as the runners all seemed to prefer… nothing. ‘Didn’t we send you enough shoes?’ they asked head coach Vin Lananna. They had, he was just refusing to use them. ‘I can’t prove this,’ the well-respected coach told them. Nike sponsored the Stanford team as they were the best of the very best. Needless to say, the reps were a little disturbed to hear that Lananna felt the best shoes they had to offer them were not as good as no shoes at all. When I was told this anecdote it came as no surprise. I’d spent years struggling with a variety of running-related injuries, each time trading up to more expensive shoes, which seemed to make no difference. I’d lost count of the amount of money I’d handed over at shops and sports-injury clinics – eventually ending with advice from my doctor to give it up and ‘buy a bike’. And I wasn’t on my own. Every year, anywhere from 65 to 80 per cent of all runners suffer an injury. No matter who you are, no matter how much you run, your odds of getting hurt are the same. It doesn’t matter if you’re male or female, fast or slow, pudgy or taut as a racehorse, your feet are still in the danger zone. But why? 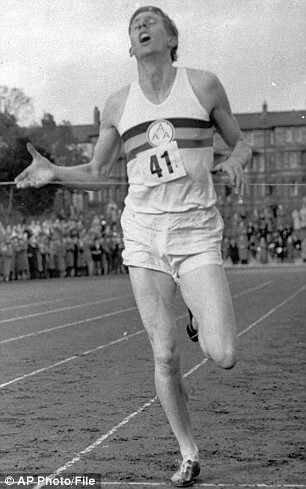 How come Roger Bannister could charge out of his Oxford lab every day, pound around a hard cinder track in thin leather slippers, not only getting faster but never getting hurt, and set a record before lunch? How come they’re not crippled? I’ve watched them climb sheer cliffs with no visible support on nothing more than an hour’s sleep and a stomach full of pinto beans. It’s as if a clerical error entered the stats in the wrong columns. Shouldn’t we, the ones with state-of-the-art running shoes and custom-made orthotics, have the zero casualty rate, and the Tarahumara, who run far more, on far rockier terrain, in shoes that barely qualify as shoes, be constantly hospitalised? The answer, I discovered, will make for unpalatable reading for the $20 billion trainer-manufacturing industry. It could also change runners’ lives forever. Dr Daniel Lieberman, professor of biological anthropology at Harvard University, has been studying the growing injury crisis in the developed world for some time and has come to a startling conclusion: ‘A lot of foot and knee injuries currently plaguing us are caused by people running with shoes that actually make our feet weak, cause us to over-pronate (ankle rotation) and give us knee problems. Lieberman also believes that if modern trainers never existed more people would be running. And if more people ran, fewer would be suffering from heart disease, hypertension, blocked arteries, diabetes, and most other deadly ailments of the Western world. The modern running shoe was essentially invented by Nike. The company was founded in the Seventies by Phil Knight, a University of Oregon runner, and Bill Bowerman, the University of Oregon coach. Before these two men got together, the modern running shoe as we know it didn’t exist. Runners from Jesse Owens through to Roger Bannister all ran with backs straight, knees bent, feet scratching back under their hips. They had no choice: their only shock absorption came from the compression of their legs and their thick pad of midfoot fat. Thumping down on their heels was not an option. Bowerman didn’t actually do much running. He only started to jog a little at the age of 50, after spending time in New Zealand with Arthur Lydiard, the father of fitness running and the most influential distance-running coach of all time. Bowerman came home a convert, and in 1966 wrote a best-selling book whose title introduced a new word and obsession to the fitness-aware public: Jogging. In between writing and coaching, Bowerman came up with the idea of sticking a hunk of rubber under the heel of his pumps. It was, he said, to stop the feet tiring and give them an edge. With the heel raised, he reasoned, gravity would push them forward ahead of the next man. Bowerman called Nike’s first shoe the Cortez – after the conquistador who plundered the New World for gold and unleashed a horrific smallpox epidemic. It is an irony not wasted on his detractors. In essence, he had created a market for a product and then created the product itself. ‘It’s genius, the kind of stuff they study in business schools,’ one commentator said. Bowerman’s partner, Knight, set up a manufacturing deal in Japan and was soon selling shoes faster than they could come off the assembly line. ‘With the Cortez’s cushioning, we were in a monopoly position probably into the Olympic year, 1972,’ Knight said. The company’s annual turnover is now in excess of $17 billion and it has a major market share in over 160 countries. Since then, running-shoe companies have had more than 30 years to perfect their designs so, logically, the injury rate must be in freefall by now. After all, Adidas has come up with a $250 shoe with a microprocessor in the sole that instantly adjusts cushioning for every stride. Asics spent $3 million and eight years (three more years than it took to create the first atomic bomb) to invent the Kinsei, a shoe that boasts ‘multi-angled forefoot gel pods’, and a ‘midfoot thrust enhancer’. Each season brings an expensive new purchase for the average runner. But at least you know you’ll never limp again. Or so the leading companies would have you believe. Despite all their marketing suggestions to the contrary, no manufacturer has ever invented a shoe that is any help at all in injury prevention. In a paper for the British Journal Of Sports Medicine last year, Dr Craig Richards, a researcher at the University of Newcastle in Australia, revealed there are no evidence-based studies that demonstrate running shoes make you less prone to injury. Not one. So, if running shoes don’t make you go faster and don’t stop you from getting hurt, then what, exactly, are you paying for? What are the benefits of all those microchips, thrust enhancers, air cushions, torsion devices and roll bars? The answer is still a mystery. And for Bowerman’s old mentor, Arthur Lydiard, it all makes sense. ‘We used to run in canvas shoes,’ he said. ‘We didn’t get plantar fasciitis (pain under the heel); we didn’t pronate or supinate (land on the edge of the foot); we might have lost a bit of skin from the rough canvas when we were running marathons, but generally we didn’t have foot problems. Soon after those two Nike sales reps reported back from Stanford, the marketing team set to work to see if it could make money from the lessons it had learned. Jeff Pisciotta, the senior researcher at Nike Sports Research Lab, assembled 20 runners on a grassy field and filmed them running barefoot. When he zoomed in, he was startled by what he found. Instead of each foot clomping down as it would in a shoe, it behaved like an animal with a mind of its own – stretching, grasping, seeking the ground with splayed toes, gliding in for a landing like a lake-bound swan. Pisciotta immediately deployed his team to gather film of every existing barefoot culture they could find. along a dirt trail, swimmers curling their toes around a starting block, gymnasts, Brazilian capoeira dancers, rock climbers, wrestlers, karate masters and beach soccer players. 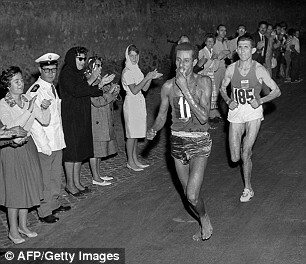 And then comes the grand finale: we cut back to the Kenyans, whose bare feet are now sporting some kind of thin shoe. It’s the new Nike Free, a shoe thinner than the old Cortez dreamt up by Bowerman in the Seventies. And its slogan? The price of this return to nature? A conservative £65. But, unlike the real thing, experts may still advise you to change them every three months. Dr Marti’s research team analysed 4,358 runners in the Bern Grand Prix, a 9.6-mile road race. All the runners filled out an extensive questionnaire that detailed their training habits and footwear for the previous year; as it turned out, 45 per cent had been hurt during that time. But what surprised Dr Marti was the fact that the most common variable among the casualties wasn’t training surface, running speed, weekly mileage or ‘competitive training motivation’. It wasn’t even body weight or a history of previous injury. It was the price of the shoe. Runners in shoes that cost more than $95 were more than twice as likely to get hurt as runners in shoes that cost less than $40. What a cruel joke: for double the price, you get double the pain. Stanford coach Vin Lananna had already spotted the same phenomenon.’I once ordered highend shoes for the team and within two weeks we had more plantar fasciitis and Achilles problems than I’d ever seen. Despite pillowy-sounding names such as ‘MegaBounce’, all that cushioning does nothing to reduce impact. Logically, that should be obvious – the impact on your legs from running can be up to 12 times your weight, so it’s preposterous to believe a half-inch of rubber is going to make a difference. When it comes to sensing the softest caress or tiniest grain of sand, your toes are as finely wired as your lips and fingertips. It’s these nerve endings that tell your foot how to react to the changing ground beneath, not a strip of rubber. To help prove this point, Dr Steven Robbins and Dr Edward Waked of McGill University, Montreal, performed a series of lengthy tests on gymnasts. They found that the thicker the landing mat, the harder the gymnasts landed. Instinctively, the gymnasts were searching for stability. When they sensed a soft surface underfoot, they slapped down hard to ensure balance. Runners do the same thing. When you run in cushioned shoes, your feet are pushing through the soles in search of a hard, stable platform. To add weight to their argument, the acute-injury rehabilitation specialist David Smyntek carried out an experiment of his own. He had grown wary that the people telling him to trade in his favourite shoes every 300-500 miles were the same people who sold them to him. But how was it, he wondered, that Arthur Newton, for instance, one of the greatest ultrarunners of all time, who broke the record for the 100-mile Bath-London run at the age of 51, never replaced his thin-soled canvaspumps until he’d put at least 4,000 miles on them? So Smyntek changed tack. Whenever his shoes got thin, he kept on running. When the outside edge started to go, he swapped the right for the left and kept running. Five miles a day, every day. 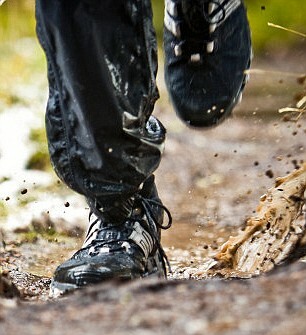 Once he realised he could run comfortably in broken-down, even wrong-footed shoes, he had his answer. If he wasn’t using them the way they were designed, maybe that design wasn’t such a big deal after all. He now only buys cheap trainers. ‘Barefoot running has been one of my training philosophies for years,’ says Gerard Hartmann, the Irish physical therapist who treats all the world’s finest distance runners, including Paula Radcliffe. 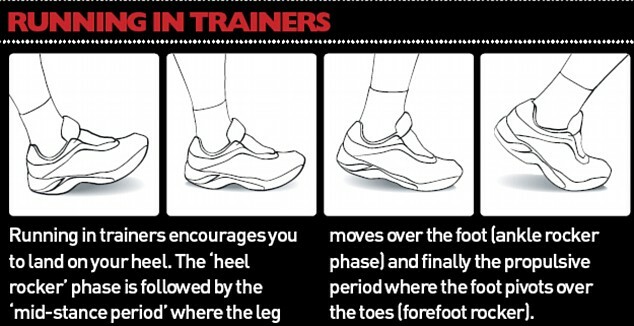 To see pronation in action, kick off your shoes and run down the driveway. On a hard surface, your feet will automatically shift to selfdefence mode: you’ll find yourself landing on the outside edge of your foot, then gently rolling from little toe over to big until your foot is flat. That’s pronation – a mild, shockabsorbing twist that allows your arch to compress. Your foot’s centrepiece is the arch, the greatest weight-bearing design ever created. The beauty of any arch is the way it gets stronger under stress; the harder you push down, the tighter its parts mesh. Push up from underneath and you weaken the whole structure. SO SHOULD WE ALL BE RUNNING BAREFOOT? Running barefoot may have some benefit in muscle strengthening as the muscles have to ‘tune in’ to the vibrations caused by impact loading. If, like Zola Budd, you grew up running barefoot on a South African farm, your tissue tolerance would adapt over time. But for someone who has grown up wearing shoes and is a natural heel striker (see right), the impact loading will be beyond tissue tolerance level, and injury will occur. We are all individuals, therefore it is prudent to have your own running technique assessed and work around that. 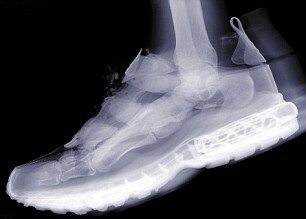 As for getting out your old worn out trainers and running in them – don’t! Based on the individual’s size and running surfaces/conditions shoes should be changed between 500-1,000 miles. 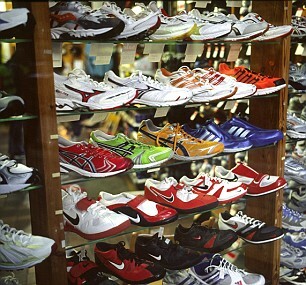 It’s best to seek the advice of a specialist running store.